What is Colour Psychology - META-Health Academy. What is Colour Psychology - META-Health Academy. Why do we prefer certain colours? What does this reveal about our emotional state? What are we compensating for through the colours we wear? 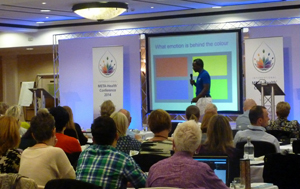 How can understanding colour help us to heal? Colour is the mother tongue of the unconscious mind. 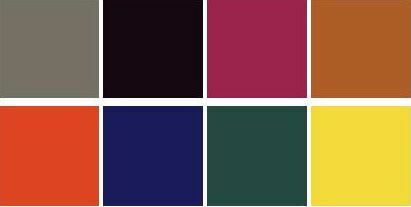 Colour Psychology uses a simple and profound colour test to identify the hidden emotions. It enables us to identify where we have a fixed image of our self - that which creates separation, dissatisfaction and dis-ease, and identify our authentic self image - the principal generator of a peaceful, healthy life. How we see ourselves is the principal source of our bodily, mental, emotional and social reactions. Our self image determines whether we feel peaceful, stressed or traumatised by our experiences. It affects how we communicate with others and our environment. We have two self images. One fixed and one authentic. This is the meaning of individuality: indivisible duality. The fixed egocentric self image can make us ill, is the real culprit of dis-ease and separates us from others. The authentic image of Self is the chief healer and the principal generator of a peaceful, healthy life filled with joy and happiness and connects us with our social environment and nature. With the help of colours, the fixed self image that you hold of yourself becomes visible thus giving us the possibility to adapt to reality in an authentic way. The Colour Test enables this hidden fixed images to be identified quickly, easily and accurately. The course is taught by Dr Kwesi Anan Odum, META-Health Master Trainer and medical doctor with a specialism in Ophthalmology. 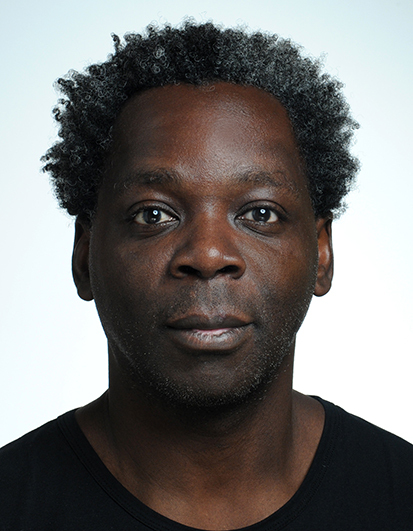 Dr Kwesi was trained by Swiss Professor Max Lüscher in Colour Psychology, and has used and trained others in Colour Psychology for many years. 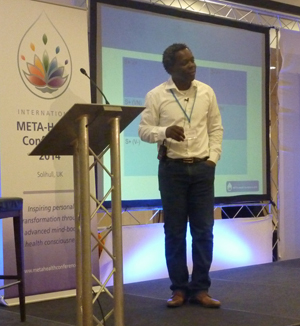 Dr Kwesi is the creator of META-Vision and a world-leading authority in understanding the mental and emotional causes of eye conditions. 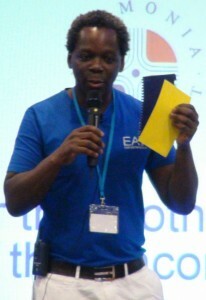 He is actively involved in researching and integrating different approaches to health and personal development, and has conducted Colour Psychology Trainings in Germany, India, Egypt and the UK. Dr Kwesi brings together a wealth of understanding from various fields, including META-Health, modern medicine, Colour Psychology, Paut Neteru (ancient Egyptian Tree of Life), 64keys, Astro-Medicine, I Ching, Numerology and Tarot, to offer a deep understanding of ourselves. He is a knowledgeable and approachable trainer who will inspire you to experience what it means to be authentic with your self. His courses are both relaxed and richly informative. 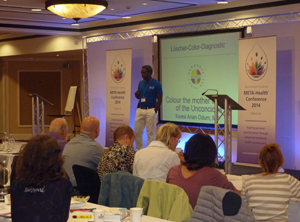 Dr Kwesi brings together an understanding of Colour Psychology with META-Health to provide a simple and deep insight into the nature of health issues. For example, META-Health reveals that eczema and neurodermatitis are caused by a loss of contact conflict. A person with these symptoms wants to connect. In the Categorical Colour System, blue is the colour of belonging, which is what the person is seeking. As they don't want to be alone, they would reject yellow, the colour of inner freedom. The solution to this issue lies in the other two colours, red and green. Red is the colour of self-confidence and action. Green is the colour of self-esteem and self-determination. Red and green together represent responsibility. So the solution for an individual with eczema is to accept that they can't always be connected and develop their self-responsibility and let go the underlying anger because they do not feel connected. 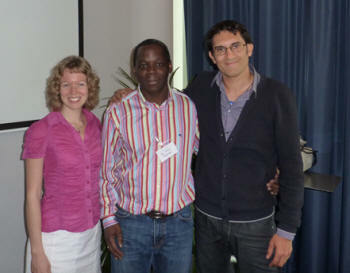 On the Colour Training, you will learn how to work out these meanings and solutions for different issues. You’ll also deepen this understanding with knowledge of the logical categories, including space, time and communication. Enter your first name and email address below. We will then send you an email as soon as new course dates are announced. Then you can decide if you want to book on to the course.